If may not be quite as Hasselhoff-cool as the KITT PC casemod, but If anything can be said about this VW Beetle PC mod, it's that the craftsmanship is absolutely beautiful. 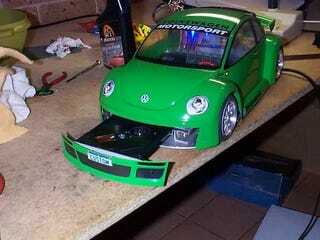 Someone took a scale Beetle model and crammed a fully functioning PC inside of it. The front bumper has a slotted laptop-style CD drive, and the rear bumper flips up to unveil the necessary ports for PC operation.